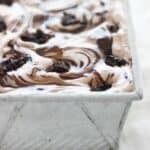 This No-Churn Fudgy Brownie Batter Ice Cream is flavored with brownie mix and loaded with chunks of fudgy brownies. The fudge swirl is just a bonus! Do you guys remember a month or so ago when I told you that my microwave broke? Since then we have had a new microwave sitting on the floor right outside the kitchen that I have been using while we waited for our new one to get installed. Ours has the hood/vent on top, so we thought it would be a lot harder to install than it actually was. I use the term “we” pretty loosely and I just stood there when asked. So anyway, finally I’ve got a working microwave installed in the proper place and all is right in the world again. Kidding. Kind of. 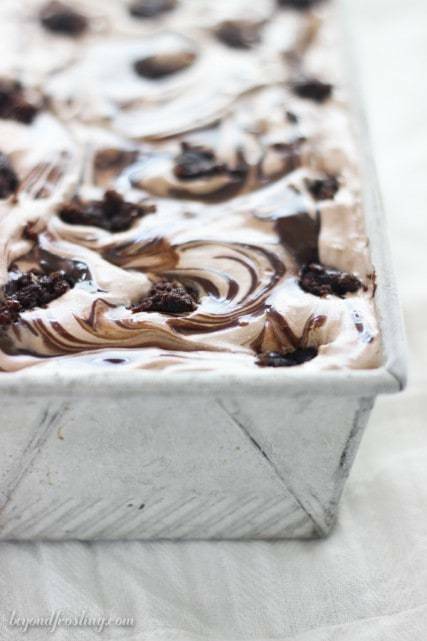 One thing that doesn’t need a microwave is this No-Churn Fudgy Brownie Batter Ice Cream. 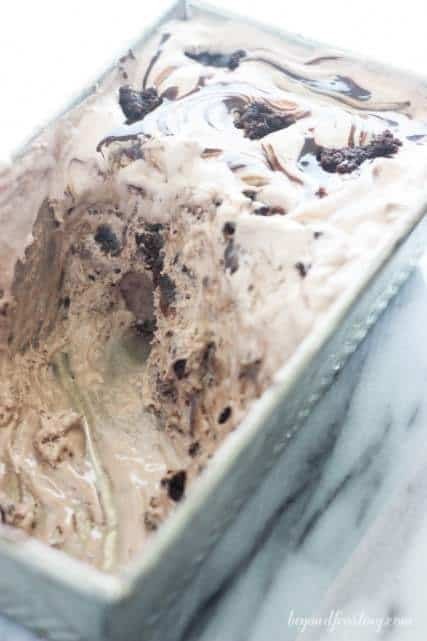 I decided to make this ice cream after I made my Brownie Brittle Ice Cream Cake. 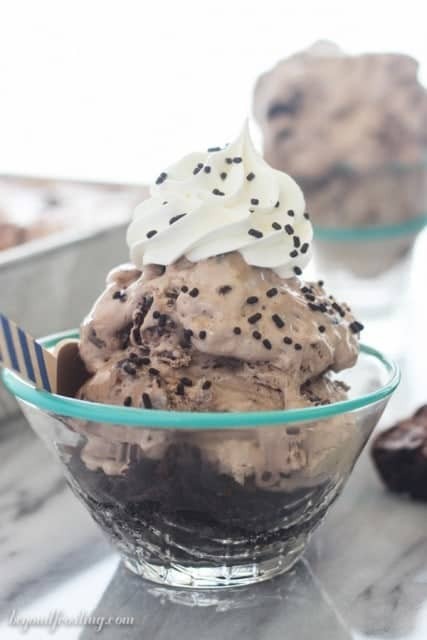 The brownie batter ice cream is a no-churn ice cream flavored with brownie mix. 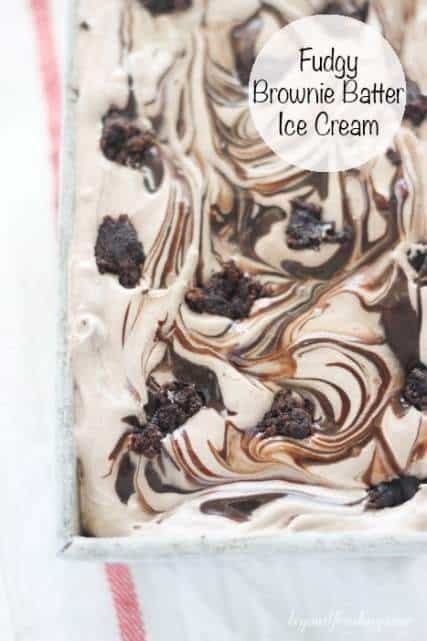 Bonus, this ice cream is loaded with chunks of fudgy brownies. No-churn ice creams that are made with sweetened condensed milk are so easy because they usually have minimal ingredients. In this case, the dry brownie mix is combined with the milk, and then folded into Cool Whip. 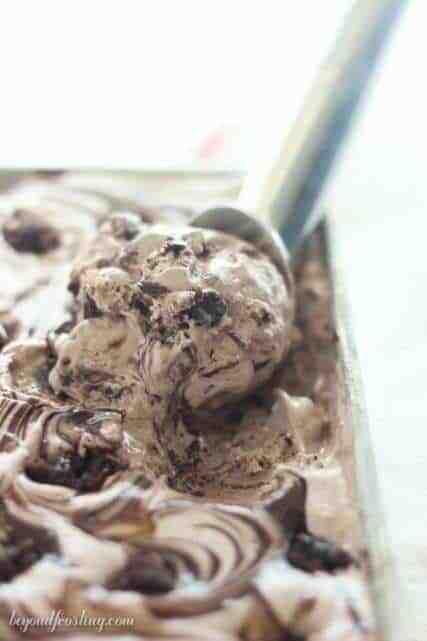 For this ice cream, I prepared a batch of brownies and added them to the ice cream base. If it’s too hot to turn on your oven, try grabbing a couple brownies from the store and chop them up. I saved a handful of brownies to drop on the top of the ice cream. I swirled a little hot fudge sauce into this ice cream because there wasn’t enough chocolate, ya know? 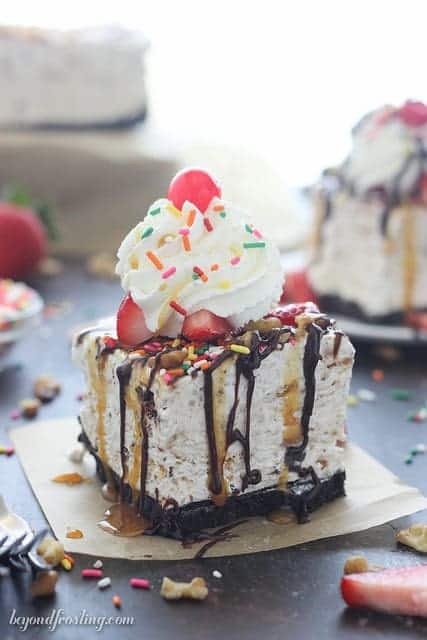 I used a jar of store-bought hot fudge sauce, warmed it up and poured a little bit on top of the ice cream and then just used a knife to swirl it into the ice cream. Easy right? The one thing about no-churn ice cream is that it does not get a firm as traditional ice cream. It is more like a frozen custard. So once you pull it out of the freezer, serve it quickly! I am sure you won’t have a problem finishing your bowl quickly! You know what else? This ice cream would be perfect to make as a popsicle as well! Prepare a batch of brownies and allow to cool. 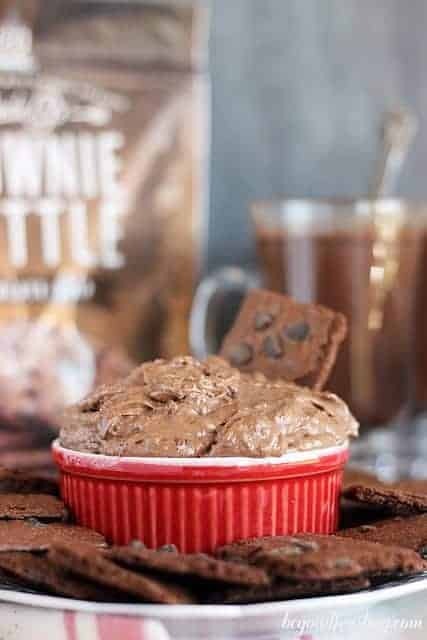 In a large mixing bowl, combine sweetened condensed milk and dry brownie mix. Beat until well incorporated. Add thawed container of Cool Whip. 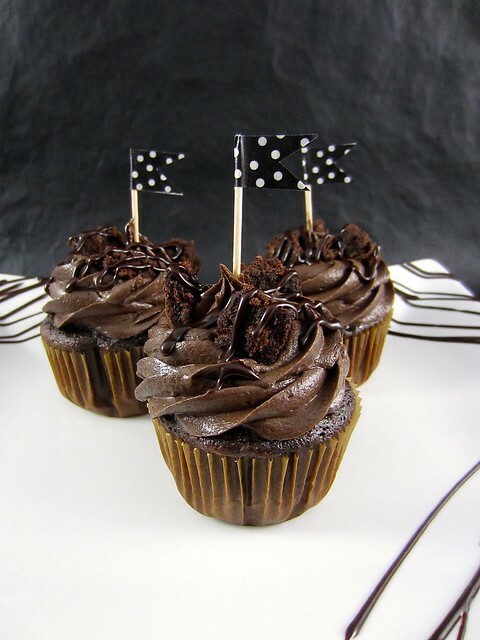 Filling must be well mixed; use a spatula to overturn the mixture from the bottom to the top if necessary. 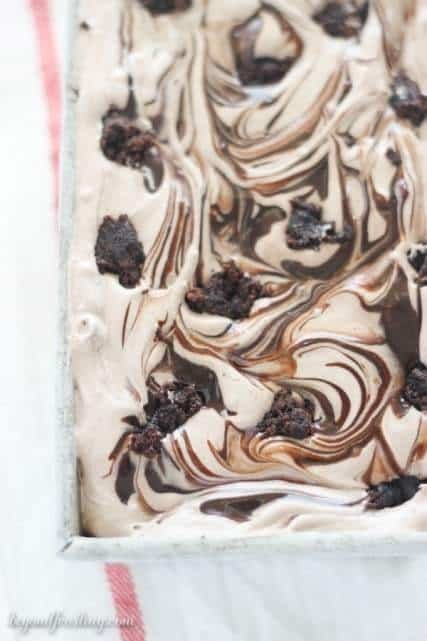 Break brownies into chunks and mix into ice cream. 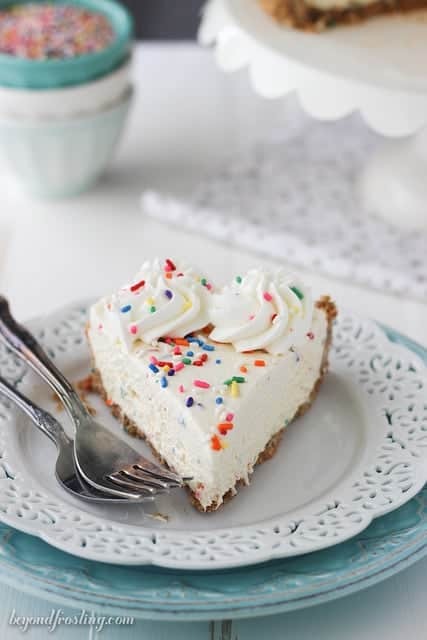 Save a handful to sprinkle on top. Microwave hot fudge sauce for 30 seconds. Spoon some onto the top of the ice cream and swirl with a knife. 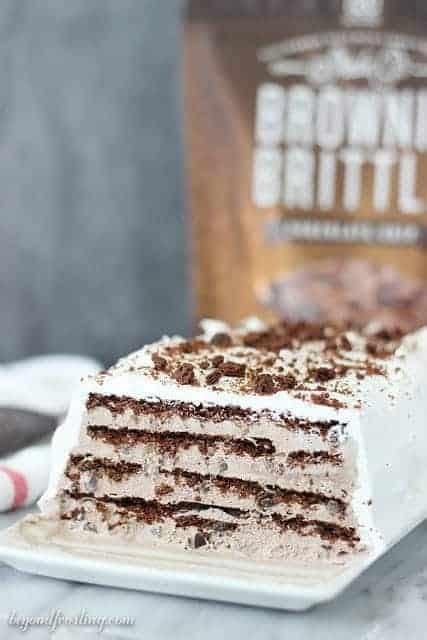 Could I use Reddi whip instead of cool whip? Hi Robin, do you mean Reddi Whip from the can? I am not sure if that would work the same way, I’ve never tried it. What is dry brownie mix? haha, I wouldn’t be able to function without my microwave!!! glad you got it worked out! and this ice cream!!! ohmygawd!!!! love!